Nestor is a graduate of DeAnza College where he studied massage therapy that included holistic studies in Eastern and Western philosophies. At Massage Therapy Center Palo Alto, he offers clinical deep tissue massage, myofascial release, neuromassage, sports massage, Swedish massage, and trigger point therapy. He respects each modality as a separate science but likes to incorporate a bit from each into his sessions. 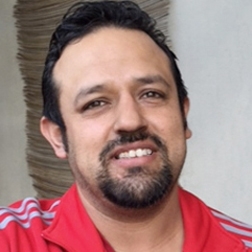 Nestor’s intention is to support his clients in a healing experience that reconnects them to deep listening to their body’s needs. His sessions are deeply releasing, relaxing, and restorative. Nestor played many sports in the past. He now enjoys walking in nature and mountain biking and likes spending time with his family attending theater, sports, and multi-cultural events.